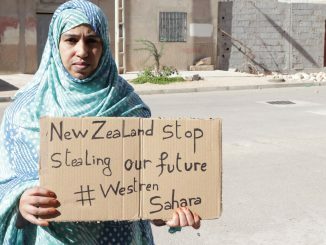 But if Parker really wants to hone his crisis-managing chops on an international trade dispute that New Zealand has been making worse for years, he maybe should be turning his attention to the Western Sahara. You recall how PM Jacinda Ardern and her coalition colleagues always bang on about the virtues of a rules-based international order? Well, Morocco (a) illegally annexed Western Sahara in 1976 (b) pushed many of its resident Sahrawi population into refugee camps in Algeria operated by the Polisario Front and (c) has been busily plundering the territory’s natural resources ever since. If we want to help the UN reach a fair and just solution to this protracted dispute, New Zealand could start by not being a willing accomplice to Morocco’s systematic process of exploitation. To that end, Parker and Fofreign Minister Winston Peters should perhaps actively engage with Ravensdown and Balance Agri-Nutrients, and explain to them that business-as-usual is giving this country a very bad name, internationally. It is not as if the United Nations hasn’t been doing its best to achieve a fair outcome. In 1991, the UN set up a peacekeeping mission (called MINURSO) to set up a referendum vote on independence for Western Sahara, but Morocco has consistently stymied those efforts ever since. At most, Morocco is willing to offer Western Sahara only a limited form of autonomy under its control. Polisario maintains that Morocco has no right to make any such offer, and insists on the UN referendum – if only because this is the sole route through which the Sahrawi people themselves get to decide their own future. Ardern is very well acquainted with this stalemate. During her term as president of the International Union of Socialist Youth in 2008, she visited the Polisario-run refugee camps in Algeria, an experience she referred to in her maiden speech in Parliament. Polisario would very much like Ardern to intercede with Ravensdown and Balance Agri-Nutrients, so that the resources of Western Sahara can be conserved until such time as their rightful owners can benefit from them. A few months ago, Stuff journalist Charlie Mitchell wrote an excellent series of articles about the New Zealand involvement in Western Sahara. Those articles included the rationales put forward by Ravensdown and Balance Agri-Nutrient for continuing to purchase what many international observers regard as stolen goods. Basically, that rationale come down to (a) this type of phosphate is really good for New Zealand conditions, and (b) why should their actions be regarded as decisive in a complex dispute that the UN has failed to resolve for decades? The Stuff series on the arguments – and counter arguments – can be found here and also here. And oh, here as well. And there’s also some very good information in Mitchell’s follow up story here. Political expedience may explain why Labour would prefer this issue to go away. During 2018, the coalition government has been spooked by those low levels of business confidence. Given that climate, would Labour ever feel brave enough to tell two farmer-owned co-operatives (ie, Ravensdown and Ballance Agri-Nutrient) who they should trade with in the national interest, and who they shouldn’t? Hardly. Such actions would be depicted as the Stalinist jackboots of Labour stomping all over rural New Zealand, mainly for the benefit of Jacinda Ardern’s old lefty pals in the Polisario Front. Compared to that nightmare prospect, fixing the trade wars between the US and China looks like a walk in the park. Even so, the Western Sahara dispute is not going away any time soon. Quite the reverse, in fact. For the first time in 10 years, formal talks are about to take place with all of the main participants – such as Morocco, Polisario, Algeria and Mauritania, which is home to its own large population of Sahrawi refugees. These meetings in Geneva in early December are being brokered by the UN Secretary-General’s Special Representative on Western Sahara, Horst Kohler. Not that the talks in Switzerland will be addressing the substantive issues. At best, they will merely try to come up with an agreed general framework for future negotiations. Even achieving that modest goal will not be easy. Both sides of this dispute have held non-negotiable contradictory positions for decades. This year, Morocco has been given plenty of reason to think that Washington regards its draft autonomy plan as a realistic and desirable compromise. Meanwhile Polisario (with UN and Algerian support) is still firmly holding out for the referendum it was promised over 27 years ago. Bad faith is rampant. Morocco is routinely depicted as a corrupt monarchy intent on holding onto the ill-gotten gains (from minerals, fishing, oil and gas) it extracts from Western Sahara. Equally, the Polisario Front is routinely depicted by its enemies as (a) Algeria’s pawn and buffer in its historical land grievances against Morocco, and (b) as an organisation that allegedly pockets humanitarian aid and runs lucrative smuggling operations on the side while (c) managing the refugee camps with an iron hand. There is some truth to the accusation that a contributing factor in why this dispute has dragged on for so long is that all sides – except the Sahrawi people in the middle of it – have stood to benefit from maintaining the status quo. If so, that status quo is now under pressure from an unexpected and volatile source: John Bolton, the US National Security Adviser. As the influence of Defence Secretary James Mattis has waned this year, Bolton has become the main force shaping and executing the Trump administration’s foreign policy, to the point where some observers have recently begun to call him “President Bolton”. Crucially, Bolton has always been a fierce critic of what he regards as expensive and ineffectual UN peace-keeping missions. On that score, the MINURSO mission was set up 27 years ago to deliver a referendum that has never happened. Reportedly, MINURSO’s head of mission Colin Stewart has even been unable to meet with Polisario’s leadership due to the Front’s insistence that this meeting must occur in Western Sahara, and not in the Tindouf camps. For these and other reasons, MINURSO is now firmly in Bolton’s gunsights. For example: in a UN Security Council vote held in late October, Bolton saw to it that MINURSO’s mandate would be extended for only six months, and not for the year’s extension desired by France and Morocco. More seriously, Bolton has also ensured that the US contribution to MINURSO’s $53 million annual budget would be halved next year, from $16 million to $8 million. If MINURSO was ever to be removed from the equation, its other role – as a conflict-prevention buffer between Morocco vs Polisario, or even between Morocco vs Algeria – could well see the region degenerate once again into open fighting that would be far more costly than a mere $53 million per year. This risk of resumed conflict was referred to by New Zealand during our term on the Security Council in 2016, where we advocated for the exercise of genuine self-determination. In his book “Surrender Is Not an Option: Defending America At The United Nations And Abroad,” Bolton called for the termination of the mandate of the UN peacekeeping mission in Western Sahara (MINURSO), because it had failed to fulfill its mandate. “MINURSO had failed in its central mission to conduct a referendum and was now actually an obstacle to Morocco and Algeria dealing with each other,” Bolton said as he was describing the details of a meeting he held about the issue in June 2006 with over thirty American diplomats. Bolton was convinced that “Morocco was never going to agree to a referendum where independence was a real option….Since it was clear that Morocco had no intention of ever allowing a referendum, there was no point in a UN mission to conduct one. Instead, and typically of the UN, MINURSO seemed well on the way to acquiring a near-perpetual existence because no one could figure out what to do with it,” he said. For that reason, MINURSO stands to be the main casualty if those Geneva talks in early December fail to deliver anything of substance. So… there are a couple of issues to do with Western Sahara on which Parker can hone his negotiating skills. Domestically, Parker and Foreign Minister Winston Peters should be doing all they can to convince Ravensdown and Ballance Agri-Nutrients to stop aiding and abetting the colonising power in this dispute, given that this trade is dragging New Zealand’s name through the mud, especially in Africa. A lot of negative publicity for this country was recently generated by the successful use of international law in the South African courts, which resulted in the seizure and sale of a phosphate shipment that had been bound for New Zealand, on environmental grounds, this issue may also provide a useful opportunity to re-consider whether covering New Zealand with a thin layer of phosphates is any longer a sustainable form of farming – or of waterways conservation. Internationally, Peters and Parker should also be openly backing the Security Council stance that we took in 2016. That means (a) backing MINURSO against the Bolton onslaught (b) supporting the Geneva talks aim of creating a framework for resolving the dispute and (c) maintaining our support in the meantime for a referendum in Western Sahara as being the only just and lasting outcome. If David Parker has ambitions to be a bridge, this is where he should begin. Because this dispute is one in which New Zealand is already commercially involved, and on the wrong side of history. Footnote. It seems self-delusory to think we could be an honest, neutral broker between China and the US. When it comes to trade, the word is “amoral”, not “neutral”. Evidently, we’ll trade with anyone. Since trade is war by other means, Beijing will have also noticed that when it comes to defence and security intelligence we’re not neutral at all; we’re totally on Washington’s team. That’s not only through our membership of the 5 Eyes Alliance, but also via the pattern of defence spending that this coalition government has embarked upon, which involves buying components that fit within US/Australian defence strategies targeted at China. Are we, for instance, really and truly “neutral” on the issue of China’s increasing militarisation of the South China Sea? No, didn’t think so. The notion of us being a virtuous broker is a fantasy – and besides, the Trump administration is not currently in the business of arbitration, and compromise.